Product Description: Anlaike Brand Model GT0526 Size: 4.6x3.0x7.0 ft Rectangle shaped steam cabin has multiple functions. In the rooftop, you can find the Chromotherapy Lights around the Ceiling Shower, it has 7 different colored lights that can be fixed on your favorite color, or gently scroll through all options to create a gentle atmospheric ambiance within your cabin and bathroom. 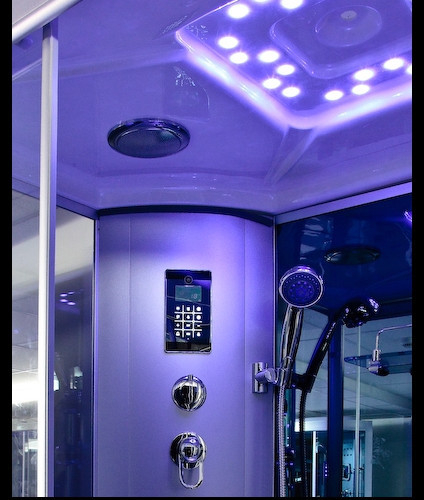 In the middle column, there is the touch operated control panel, it has Bluetooth connectivity that you can connect your devices wirelessly, whether it is your phone or tablet, make you can listen to your music either you are in a shower or steam. The Tri-jet Steam System is assembled in the bottom of the column, to emit the steam to fulfill the cabin. 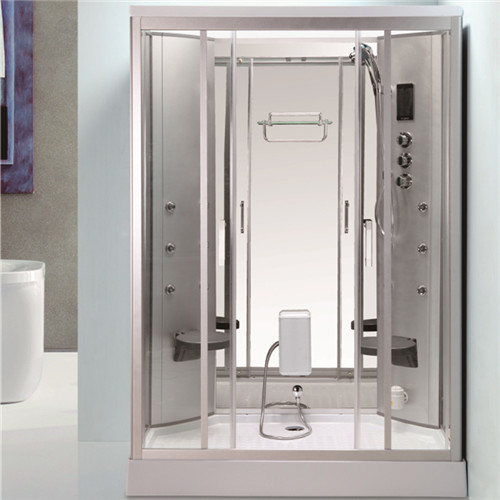 GT0526 is a Double seated shower cabin. The Pulsating Hydro-massage Jets are contained in the back of the middle column.Standing at an ample 1400mm by 900mm, this shower is designed for the larger bathroom using.